Losing weight is one of the most popular New Year's resolutions, but diets aren't for everyone. 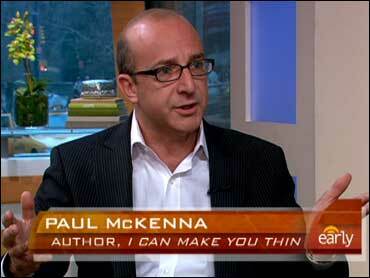 Paul McKenna, an international best-selling author of "I Can Make You Thin" offers a new approach to shedding pounds, which he considers "just about guaranteed." "We find it works for seven in ten people. Diets work for one in ten. But this is the highest statistical success rate of any weight-loss system in the world. It doesn't work for everyone. It works for most people most of the time," McKenna told Early Show co-anchor Harry Smith. Those who are overweight have a similar approach to eating. "The thing that makes the big difference is most people that are overweight think about food all the time. Except when they're eating it. And they shovel the food in really, really fast. So they flood their brain with happy chemicals. But because they're eating so fast, they can't hear the signal from their stomach that says they're full. So they eat past that and suddenly go, 'I stuffed myself, I feel bad,'" he said. McKenna has four golden rules that people can follow to help them on the road to eating less. "Number one is when you're hungry, go and eat," McKenna said. "This is not a diet. There's no nutritional information in the system. This is a way of changing the way you think about food and the way you feel about food. It's a psychological approach because what we're doing is reprogramming the brain. So instead of starving yourself, if you're hungry, actually go and eat. Now, the thing is that there are -- some people are eating because they're emotionally hungry." Another golden rule is "eat what you want, not what you think you should." "Naturally thin people eat pizza, chocolate and cheese. But they don't eat them to excess. So the way to be able to do that and not feel like you're missing out is number three - eat consciously, eat slowly. If you slow your eating speed down to about a quarter, you chew the food about 20 times, and you get rid of distractions, like rather than eat and watch TV," he said. Research shows that if you eat and watch TV, or if you eat and read a magazine, you will eat more. "And number four is very simple. When you think you're full, stop eating. So if you slow the eating speed down, you can hear the signal that says you're full," McKenna explained. McKenna also stresses a craving-buster technique, which was developed by an American scientist and involves tapping on various acupuncture points while concentrating on the desire for food. Although the technique may look very unusual, it will reprogram the way that your brain thinks about food, he explained.